Microchip Technology Inc. announces the expansion of its tinyAVR® MCU series with two new devices whch offer advanced analogue features and the largest memory variants in the family. Designed for reliable operation in harsh environments, the ATtiny3217 and ATtiny3216 offer built-in safety functions to help designers to create robust and safe systems. Improved real-time performance and accuracy: The dual ADC can be used for synchronous sampling of analogue signals, such as voltage and current, thus improving the overall system real-time performance and accuracy. Additionally, the devices feature a hardware-based Event System that enables inter-peripheral communication without CPU involvement, reducing latency and ensuring faster system response. Robust and reliable performance: Both devices come with built-in safety functions to help designers to detect and respond to voltage supply variations or drops, including Power On Reset (POR), programmable Brownout Detect (BOD), Voltage Level Monitor (VLM) and Windowed Watchdog Timer (WWDT). Improved noise immunity and functionality in extreme environments: The devices operate at up to 5V and are available in 125°C variants. 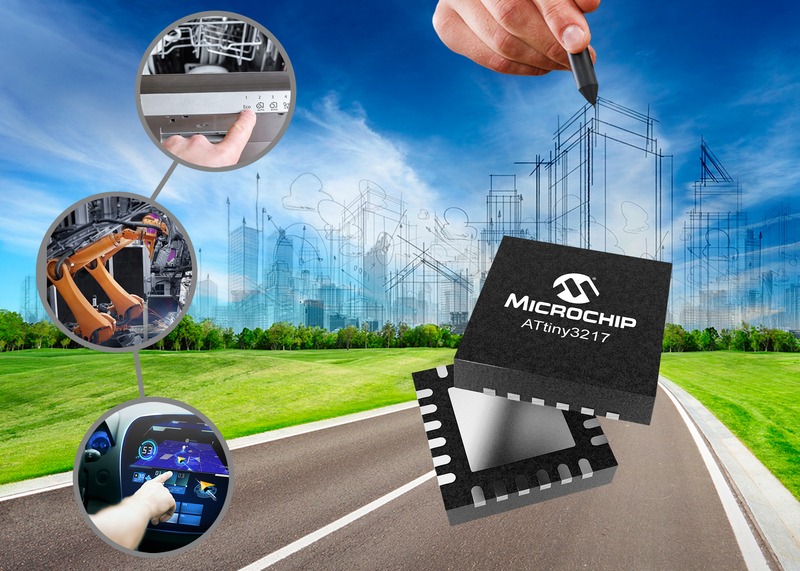 Microchip’s tinyAVR family of MCUs, including the ATtiny1617and the ATtiny817are optimised for performance, power efficiency and ease of use in small packages. All tinyAVR MCU series devices are supported by the Atmel Studio 7 integrated development environment (IDE) and the Atmel START code configurator. For evaluation purposes, the ATtiny3217 Xplained Pro evaluation kit is also available. The ATtiny3217 and ATtiny3216 are available now for sampling and in volume production. The ATtiny3217 Xplained Pro evaluation kit (ATTINY3217-XPRO) is available now priced at $38 each.